Art and beautiful both sooth and inspire the soul. 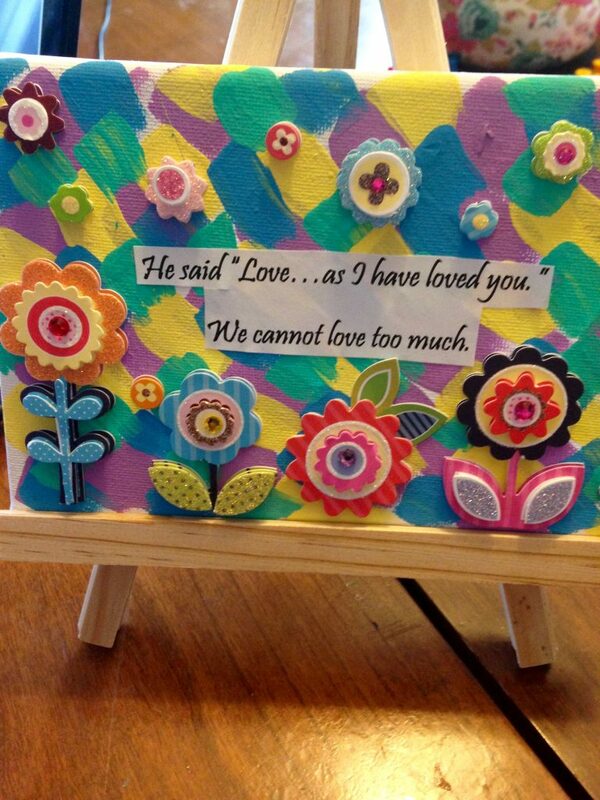 As we love crafts I wanted to share this Inspiring Quote Canvas we made. With the start of the new school year and it being the first year I would be homeschooling my daughter; I wanted to come up with a nice way to start the school year. A way that would both help inspire her and create a nice work space and that could also be easily changed as the year progresses. Thus the Inspiring Quote Canvas Project was born. Being an artist and a child whom loves to create this was a great project to start the year. We began by visiting a few websites. After a quick google search I selected three different pages to share with here on quotes: inspiring quotes for kids, inspiring christian quotes and lovely scriptural quotes. After visiting the sites my daughter picked the quote that she felt most drawn to – that inspired her. She then typed the quote out in word, adjusted the font and size to something she liked and printed it. She painted her canvas, once it was dry she glued on her quote and then finished the project by decorating with stickers. This project is both inexpensive and versatile: all the supplies were already in our home or came from the dollar store (including the canvas and stand). The best part is that as the liturgical year changes, feast days come up or she needs new inspiration – the canvas is removable. We can just use a new 5×7 canvas and create a brand new beautiful masterpiece – which we can display on her work area to inspire her daily or move to our dinner table to inspire us all at a tea party or family meal together! 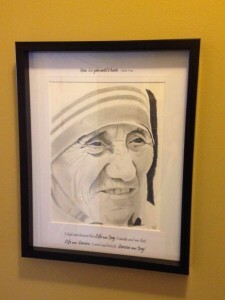 For some printable Mother Teresa Quotes to help get you start you can view my previous free printable Mother Teresa Quote Posting or you could visit my previous Inspiring Quotes and Scripture Post to help you find some inspiration to make your own Inspiring Canvas! The ideas are endless. Please feel free to comment with any creative ideas you come up with. Have fun and get inspired! 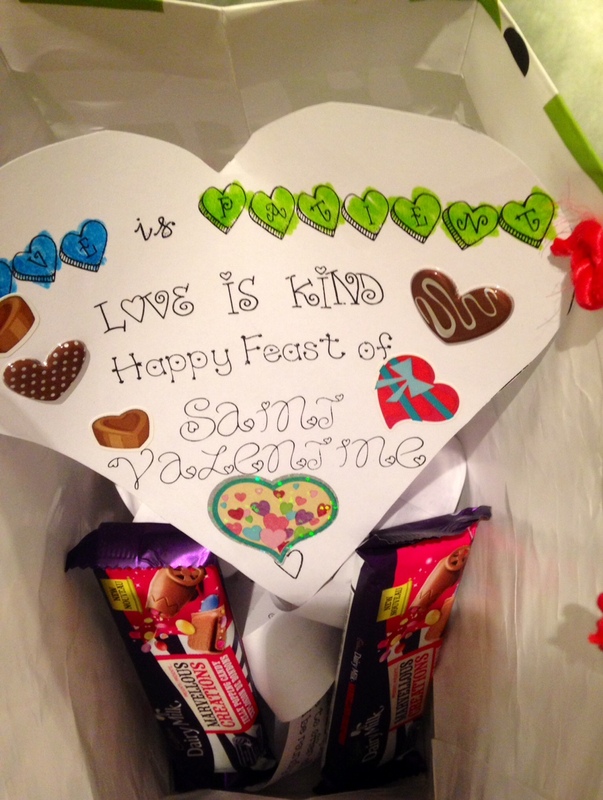 The feast of Saint Valentines Day is fast approaching. I thought this year I would like to make something fun with the kids to decorate the house. After the Christmas decorations come down each year the house feels a bit empty. So I thought why not make a fun wreath with the kids. So I came up with this super simple but fun craft. The best part is that it helps the kids learn their scripture verses too. I used a black and white printer but if you have access to a colour printer your craft could be even prettier! Tip:I enlarged the cards before printing them, so that they we easier to read. Step 3: Fold a piece of regular paper in half and then fold it in half again. Draw half of a heart (approx. the size that you want your hearts to be but keep in mind large enough so that the scripture cards can still be glued on. Tip: you can place half the scripture card on the heart to make sure it will fit.) and then cut it out. 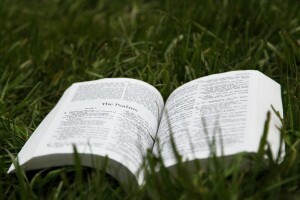 You will have two hearts – test to make sure the scripture heart fits in the heart to give it the effect you would like. 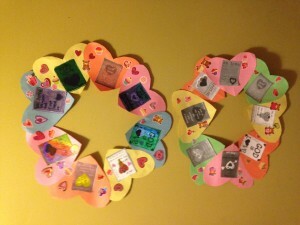 Step 4: Fold your sheet of construction paper in half and trace the heart shape and then cut out the hearts. Repeat till all four sheets are done. 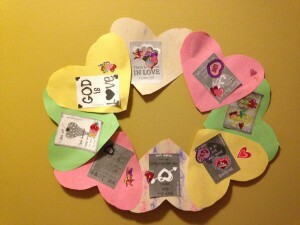 Step 5: Glue the hearts together so that they form a circle/wreath. 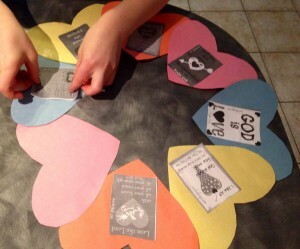 Step 6: Glue one Valentines scripture card on each heart. Step 8: Admire your child’s wreath, hang it up and then read the scripture verses together. My kids had a blast making their own wreaths. 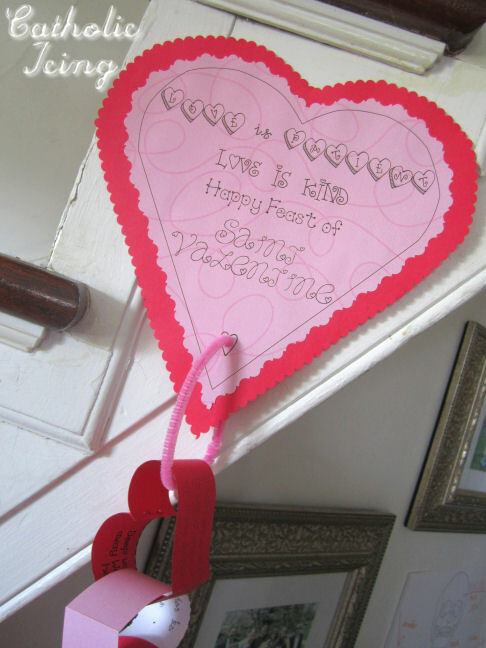 We have hung them on the same wall as our Saint Valentines Day Scripture Verse Count Down craft! It is easy to make and looks sweet on the wall. 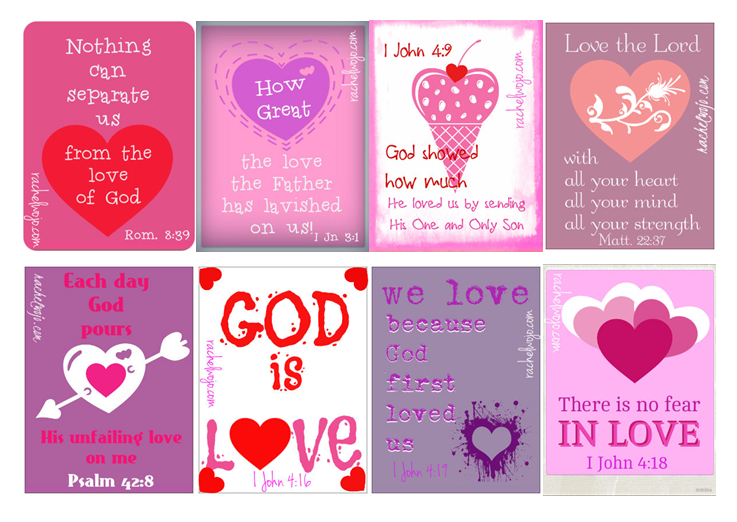 Saint Valentines Day Scripture Verse Count Down! Valentines Day is fast approaching. I enjoy celebrating this feast with my kids as it is a nice bridge between Christmas Season and Lent.We always enjoy celebrating our faith and the lives of the saints. The kids love making this craft and using it daily. 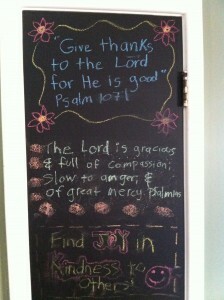 My son liked it so much he made an extra Scripture count down craft to give as a gift to a friend this year! 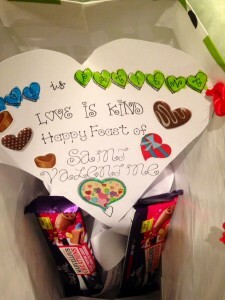 For more St. Valentines activities see my previous post. Hide it in their Hearts! Teach your child to walk in the ways of the Lord and they shall not depart. We can hear this hundreds of times in our lives. But how do we actually do it. Teaching them they have a Father who loves and adores them is important! Helping them to have a personal and deep relationship with Christ is critical. So how can we as parents, strive to guide their beautiful souls –to have a personal relationship with their heavenly Father from preschooler – through teen years to mature adults? Well the journey there like any, has many routes to get to the final destination. But one sure way to help your child get to their ultimate goal heaven – is to give them an internal GPS if you will… Engrave something so deep in their heart; that they hear the right directions. Even though they might not always choose to follow them, they can always make a U-turn and like any good GPS program – you can be sure “Your going the Wrong Way” will be blaring somewhere in the roots of their hearts – (if they decide to take the wrong or long route – the GPS will help them find the right roads back to their original destination). Hopefully they will choose to take the right path – but ultimately – God gave our children free will – just like he gave us. 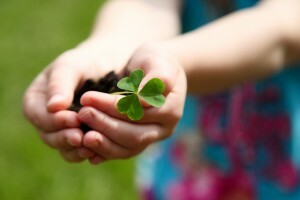 So let’s hide it in their hearts – so no matter where they go in this life – they will always know the way or the way back! Just what is it that we want to hide there? The WORD! Scripture – God’s beautiful gift of the word! If it takes over two minutes to explain the text we have already lost them. So began my journey or quest if you will to find a fun, creative and interesting way to bring the word to life for my little ones (who were five, three and under one at the time). I wanted them to be able to recall scripture in times of strife, sorrow, joy – for it to be a tool for them to carry with them throughout their lives where ever they went. So the light and love of our Lord would always be with them. So I created this blog posting in hopes to share what I have learnt and what I learn along the way! Tips, Tricks and Ideas for Helping Make Scripture Memorization work with kids! 1. Everyone loves a reward! 2. Did Somebody say Routine! 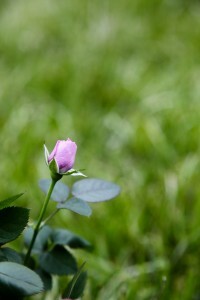 As a sanguine it is really easy and exciting for me to start new ideas – but follow- through can be hard long term. But like anything if we want to be successful – we need to form a habit – we need to build a routine. So choosing the right style and time that will work for your family is essential. We find that right after breakfast or dinner works well for us. This way we can get the verse in once or twice that day. My 6 year old can actually recite it back by them. 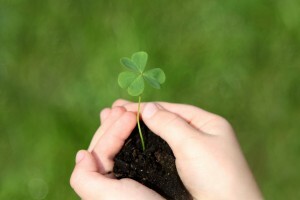 Of course life has a way of changing so we mix it up if needed. During the summer we might only get to the verse once or twice during the week. Lately we have been trying to do it with night prayers. Some families we know do the same verse everyday for a week; others just do a verse once or twice a week on a set day. Do what works for your family – remember something if always better than nothing. 3. Keep it Fun – add a Gesture! Keeping it fun and interesting for a three year old is essential – so we added hand gestures and movements. We do this as best we can to keep it fun and reinforce the scripture for easier memorization. Some verses are easier than others such as: You shall love the Lord your God. But the kids really enjoy helping to come up with the actions and showing them back to you! Especially when it involves things like jumping for joy. If you fall of the horse just get right back on again – if you forgot to do to the memorization for a few days, don’t get discouraged just try again – your perseverance will be rewarded! It might mean that you need to change when or how often you are doing your scripture verse. 6. Write it out/Print it out/Display it! Other ideas – write the verses out on sticky notes – stick them in your child`s lunch, on the bathroom mirror, in the car, on their pillow, on their desk. It’s not about the quantity but the quality – revisit the same scripture verses if you think they are applicable to a situation your family is going through or if you think the little ones need to re-learn it. Follow the Holy Spirit’s guidance, be flexible! 10. Share the word regularly! Share the word regularly at bedtime, meal times or whatever time works best for your family. Read your children bible stories – everyday if you can – form them in the word. We try to include at least one bible story a day at bedtime. Purchase some high quality attractive bible story books or devotionals that capture your young ones attention– Here are some Bible Story Books for Children that I highly recommend that my children love! The Jesus Storybook Bible: Every Story Whispers His Name – age 3 to 100 ! 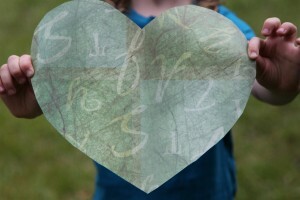 I invite you to join in and start today to hide the word in your child`s heart! It only takes a few minutes but it will last a life time! 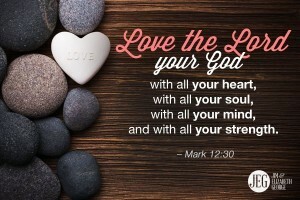 He answered, “You must love the Lord your God with all your heart, with all your soul, with all your strength, and with all your mind. 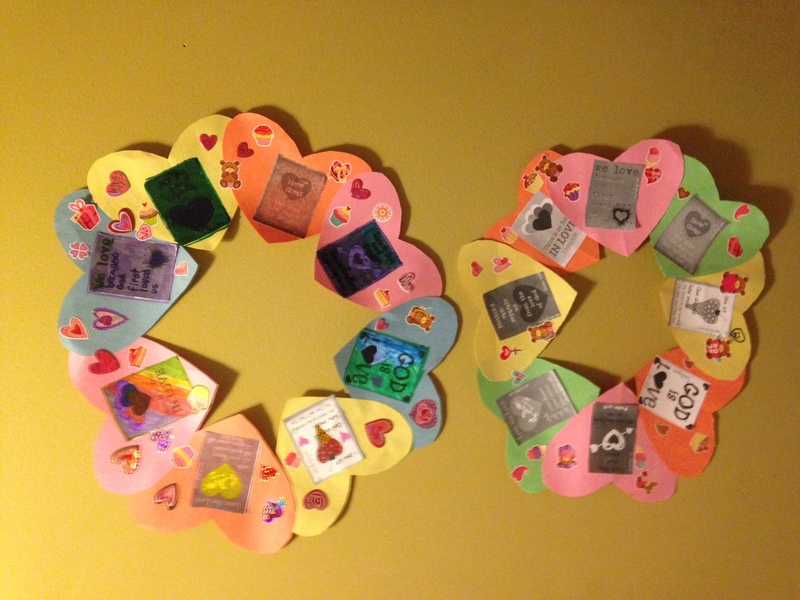 Valentines Count Down Chain – the kids really enjoyed doing this chain last year we counted down to Valentines Day then we repeated them and made the chain up again for the rest of February! 10 Scriptural Affirmations for Kids – beautiful print out! Character chart – easy to print out and have older children write out and decorate q-cards to learn!